Yesterday was a quiet day. After breakfast, Jamie packed for a trip for work and then we fell asleep on the couch until it was time for me to drive him to the airport. On the way home, I thought of all the projects I might work on over the next four days at home alone, but then I thought, when was the last time I really relaxed and just did absolutely nothing at all. So I turned off the TV, even the music channels, and enjoyed the quiet peacefulness of my own thoughts. I made a cup of hot tea and curled up in the corner of the couch with the first Harry Potter book, a series I've been meaning to read for a long time. I read and read, becoming completely immersed in Harry's magical world, until the description of the lavish banquet on the students' first night at school made my stomach growl and I realized I was starving. After rummaging the cupboards and refrigerator, there was nothing that sounded good to me, at least nothing healthy that was also tempting. I was about to eat a handful of plain almonds before I decided to toast them to bring out the nuttiness even more. 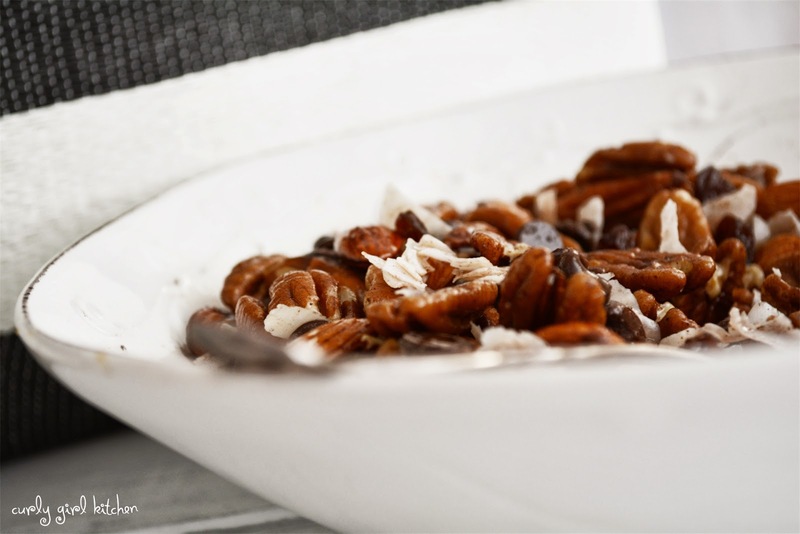 For good measure, I threw a handful of pecans on the baking sheet, too. And then, in the Moment that changed everything, I added some coconut oil to the pan. 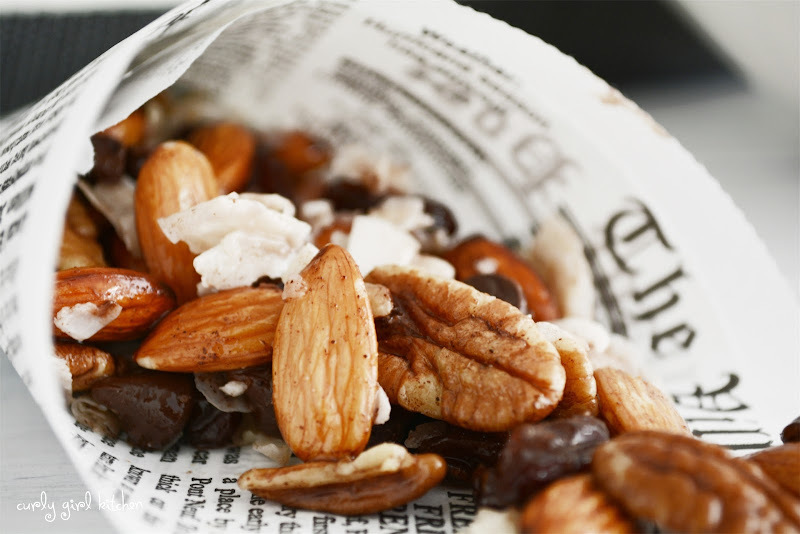 Five minutes later, the nuts were warm and fragrant, coated in a glossy sheen of coconut oil. 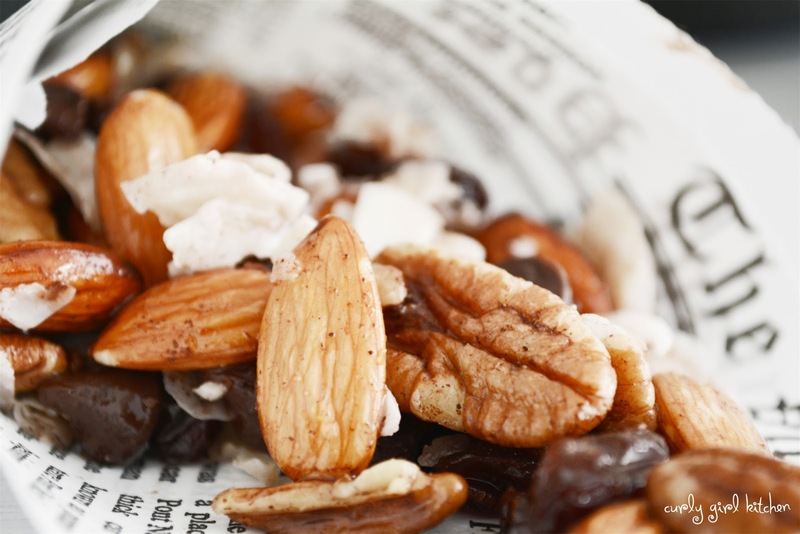 I added some raisins, which grew soft and plump against the hot nuts, and some natural unsweetened coconut. A pinch of salt, cinnamon and cloves. A few bittersweet chocolate chips. Just because. The salt and spices clung to the nuts, and I ate a few pieces before they cooled, wishing I had a few more nuts and seeds on hand to add to the mix. It was so good, that I texted my sister - and maybe even a friend or two - and said that whatever they were doing, they must stop immediately and make this trail mix. 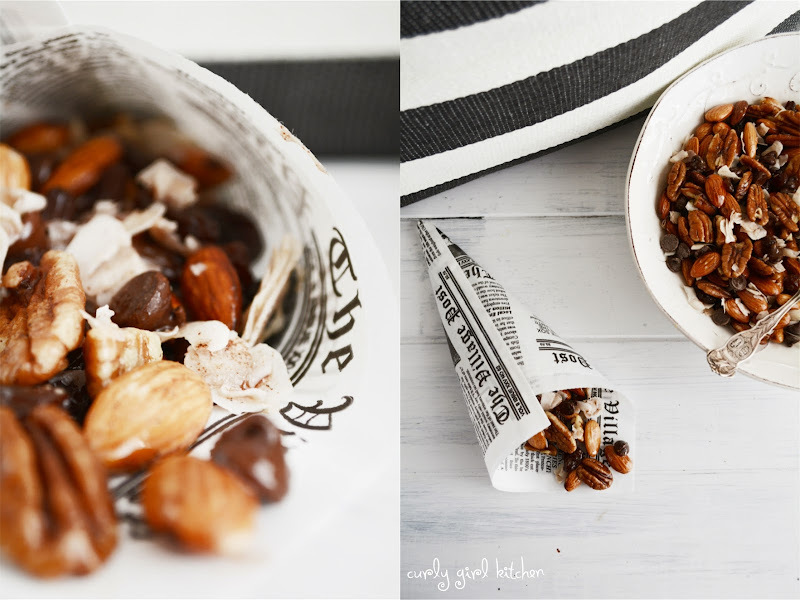 I can honestly say it's the best trail mix I have ever tasted in my life, and I had to force myself to put the bowl away and make myself a real dinner, even though I would have liked to just eat trail mix with a spoon and call it a night. 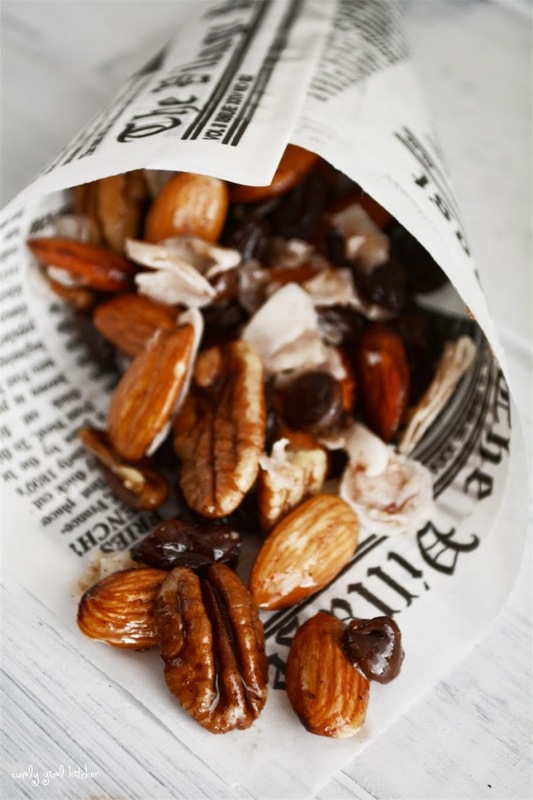 Baker's Note: If I had more nuts, seeds, or dried fruit on hand besides almonds, pecans and raisins, I would have used those, too. 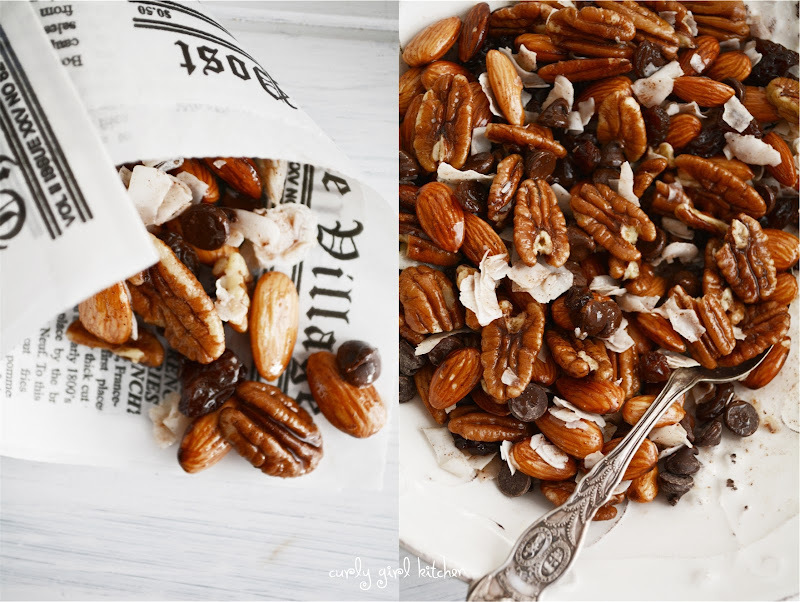 Variety is the beauty of trail mix - just use what you like and make it yours. 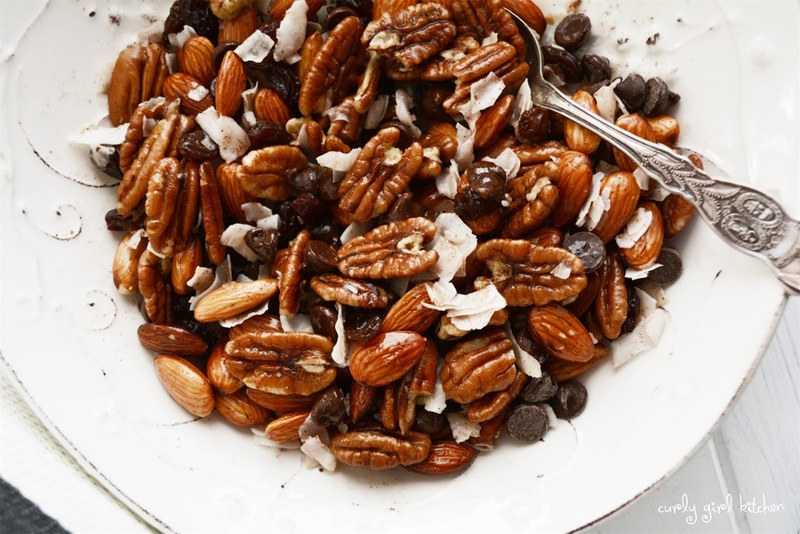 Place the nuts on a baking sheet in a single layer and drizzle with the coconut oil. Toast in a 300 degree oven for 5-7 minutes until hot and fragrant. 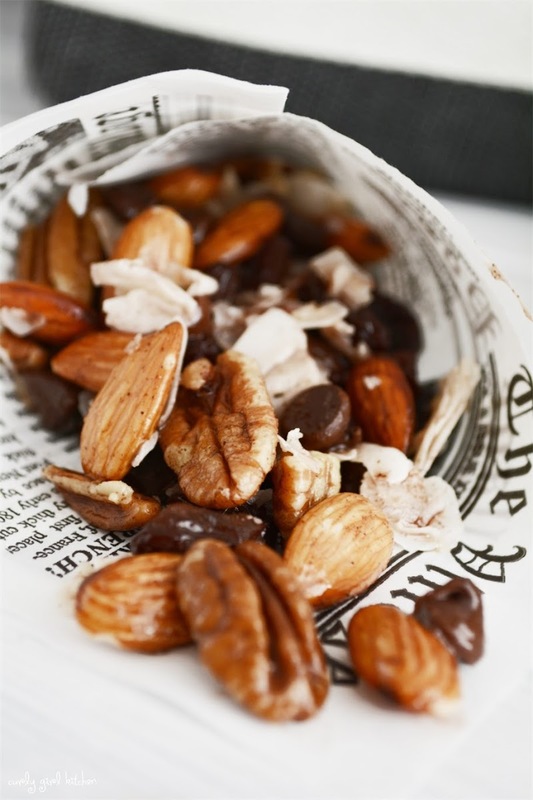 In a bowl, combine the toasted nuts and coconut oil, coconut and raisins. Add the salt and spices and toss until well coated. This trail mix is fantastic served warm, but wait until the mix cools if adding the chocolate chips.